Friday, our last day, was another busy one. We first went to Prayrona III where we were to do a project with the kids - some really little ones. In fact, Rosalie was a bit concerned that they would be so taken aback at the sight of all these big, white people (whom they seldom, if ever, see) that they would burst into tears. She had us bring candies and toys to soften them up, and by and large it worked. There were some quivering lower lips here and there, and a lot of apprehensive stares, but once they saw what we were going to do, they warmed up and had fun with it. The project was managed by our friend Sandy, who spent part of the week with us. We started with squares of white fabric, about 8" on a side, and glued a strip of rickrack across one end. Then we had the kids make thumb prints - little tiny thumb prints - in different colors and patterns on the square. We then used black sharpies to draw details on the colored thumbprints to make them into ladybugs, centipedes, birds, trees, and anything else we could think of. It was fun to watch recognition dawn on the kids' faces as the spots of color became identifiable bugs and plants. As a final Indian touch, we had the kids glue sequins onto the squares. The results were surprisingly good. Sandy collected all the squares and will sew them into seven quilts that she will take with her to the Scottish partner school that raises funding for the Prayrona schools. Sandy told me that she merely mentioned to some Indian acquaintances that she was going to sew all these squares together, and then next thing she knew, twenty women volunteered to help her. This kind of volunteering is contagious. After we were finished and said our long goodbyes to the kids, who were by now smiling and reaching for our hands, I went outside to where the cars were waiting. Four teenage boys were playing carroms on a board set up on the sidewalk. This is a game my siblings and I played endlessly as kids. I exclaimed "carroms!" as I approached them, and they all paused and smiled that I knew the game. Then, in Calcuttan fashion, one of them stood aside and asked me if I wanted to play. Of course I did. I quickly felt sorry for my partner across the table, as my shooting skills have decayed dramatically since my prime carroming days. These guys had the moves - it's all in the finger flick. The other team cleaned my clock by running the board. It was all good fun. We went to the house of the teacher, Champa, for lunch. She is a gracious host. She lives in a quiet (yes, really!) neighborhood of Kolkata in a beautiful, airy flat. The dining room is central, with bedrooms, kitchen, laundry porch and small shrine room off of it. On one of her balconies, she has a garden of potted flowers. It was nice, and interesting, to see this kind of home, after seeing homes in the bustee, which can be no more than 10' by 10' and house eight or ten people. Of course, there are palatial residences in the older colonial neighborhoods. One of these, which though still privately owned is partly open as a museum, is the Marble Palace, which we saw on the day of our city tour. A quick note on that: it is a large, marble house, with cavernous function rooms in two stories that enclose a central courtyard. It is in rather neglected condition. The owner, a wealthy potentate, assembled an eclectic collection of European and other art, none of it of particular note that I could determine. However, there are marble statuary, enormous cut-glass chandeliers, furniture, clocks - you name it. One of the interesting things is a grand piano, the first in Kolkata, according to our guide. Kira, Chelsea and Caitlin, going to use the facilities, ran across the owner of the house preparing to do her work-out, and had a conversation with her. She was very curious about them. But . . . back to our day. Thursday, we went to Dakshindari, the bustee (the slum neighborhood) where Prayrona II sits, at the end of a narrow alley. Reena, who teaches there and at the other Prayrona schools, told us that the kids had been waiting for us for months. When our plans to visit were finalized last March, she told the kids that we were coming, and they were so excited that Reena wished she hadn't told them so early. Waiting is a hard thing for kids! So were arrived, all the aunties and uncles, to lend them our cameras and follow them around the bustee while they snapped away. I had two little girls with me, Sabana Khatun and Sabrale Khatun, and after a couple of quick demonstrations about standing still and pushing the shutter release all the way down when shooting, off they went. At first, they were clicking on the run, and we got a number of great shots of feet, sky, and headless persons. But they got the hang of it very soon. All told, they took nearly 200 pictures of vendors' stalls, mini-factories, old people, babies, families, kitchens - everything you can imagine, and many things you couldn't. I noticed that the bustee was cleaner than it has been in the last two visits, and I came across a crew actually shoveling a pile of garbage into a truck for disposal. The two shutterbugs tussled over the camera a couple of times, but it went very smoothly. We have done this outing twice before, and Reena prompts the kids before we get there, so they knew what kinds of things to photograph. At first, it was just the three of us wandering around, but word travels fast in the bustee, where so many, many people live in close quarters, and we soon had a posse following us. I don't know how many kids came up and eagerly said "hello," and "where are you from?" Visits by westerners to the bustee are rare, and we were both a curiosity and a pleasure for them, I think. Everyone is friendly and smiling when they see the kids with the cameras. One man stopped me and asked, "Can you train them?" If these kids were not in school, they would be working to support the family. It is a measure of how well Reena has worked with the parents to get their support to be asked the question that this man asked me. They do get it - they want their kids to get what the school can help prepare them for - a life better than laboring in the slum, or as a servant in a well-off household. The kids have self-esteem and self-confidence, especially the kids whom I have seen now three times in three years. The ones who were so little three years ago are now noticeably self-possessed. When I look at them, and then at the little ones eating their healthy lunch and laughing and smiling at us, I'm confident that they are in good hands, and that our visits and support is making a difference for them. The photo is my friend (and self-possessed young lady) Saboo. Wednesday night was the party of the season at the Fairlawn Hotel. Mrs Smith, the owner and manager of the hotel since waaaaay, back, turned 90 on Wednesday, and no effort was spared on the celebration. All she wanted was a toy boy, and whether she got one I can't say. She did enjoy "juicy kisses" from your correspondent, who enjoyed them too! The evening started with the corniest magician you can imagine, and yet it was funny and engaging. He did a particularly amazing stunt that involved a box with a door on one side being set over an assistant's head, which, after opening this door to show the man's face inside it, was run through with a dozen or two fakey-looking knives, to exaggerated gasps from the crowd. To everyone's horror, he opened the door to reveal a mass of criss-crossed knives where the assistant's face should have been. The door was closed, the knives dramatically removed one by one, and the box was lifted. And there was the assistant's remarkably bloodless head, firmly attached to his neck. What a hoot. Then we had a very nice speech from Jennie Fowler, Mrs Smith's daughter, into which Mrs Smith interjected her saucy commentary. Our girls, Kira, Chelsea and Caitlin, sang an a capella medley of "Isn't She Lovely" and "Happy Birthday," which was beautiful and delightful, and had everyone enchanted at how wonderful they were to serenade Mrs Smith. Then the band fired up, and we all realized that nobody there needed even half an excuse to get to the dance floor. For a mature crowd, these old English ladies had some moves! The dancing went on nearly non-stop until the band quit, hours later. The staff was eventually pulled onto the floor, too, and danced along with us. I think the liquor cabinet was bare by the end. To our amazement, all of these dancing crazies were there at breakfast, none the worse for wear. I'll admit it took me some time to revive. And Mrs Smith, 90 years young, stayed for the whole party, and had this toy boy's undivided attention for a while to boot. Back. So we left off at the railroad crossing on the way to Kharmagachi. We did make it, and contrary to what my senses told me, I did not have any teeth shaken loose on the washboard roads. The drivers were constantly lost, stopping to cross-examine pedestrians along the way and arguing between them, until we finally got to the village. Shelley received us in her house, and then we walked to the vocational school. I can't believe how much improved the girls are as artists! Thanks to Michelle Marx's generosity, an art instructor comes three days a week to teach them, and the lessons have clearly made a difference. Their pieces are beautiful. There are delicately designed and painted cards, and hand-stitched saris and other fabric pieces. I couldn't resist one of the saris - it has a beautiful pattern with peacocks on a red silk cloth. I might even wear it myself. Not to the office, probably. We dawdled there for a bit, and then wandered down a lane into the fields. Along the way, a woman came out of one of the houses and told us (!) that we were coming in. So we did. Within minutes there were plastic chairs collected from several of the neighboring homes and set in a circle in their swept-dirt courtyard. She offered us lunch. Caitlin, Chelsea and Kira started some games with the little kids, and soon we had a crowd watching and laughing with us. It was a great spontaneous party. From there, we went to a field where some older boys were playing cricket. We were shown to a line of plastic chairs, and shortly after, dancers and drummers came to do a performance of traditional dance and music for us. Some of us had seen such a performance last year in the small enclave in the village where these dancers live. They are of the untouchable class, and are segregated even within the small village of Kharmagachi. This time, though, we had at least 300 people from the village, perhaps more, standing behind us watching the dance. The drummers, all men, face the dancers, all young women, who are positioned in two lines of six or so girls each, one line behind the other. As drummers play, they turn slowly counter-clockwise, and the two lines of girls, arms entwined, perform intricate dance steps that take them in a circle so that they remain facing the drummers in a kind of orbit around them. There are several dances that we saw, each with a different beat and different dance steps, but all following this pattern of turning in a slow circle. After a few dances, they pulled us out to dance with them. Oh my! I did manage not to step on any of these tiny girls' toes, and even managed after a few orbits to get the dance step down. Our audience of several hundred laughed and hooted in delight. They mobbed us like we were rock stars after we were done. I am so happy at the progress that the girls have made with their sewing. Their work would sell quickly at any shop in the U.S.
On Wednesday we went to the Rehabilitation Center for Children (RCFC) in Kolkata. This is a remarkable place where kids with orthopedic disabilities come for surgery and rehabilitation. Most of the kids here have club feet or other leg deformities. If they are under the age of three, their mothers can stay at the hospital with them. Since many of them need several surgeries to correct their conditions, they stay for several months, and can stay for up to two years, at no cost to them. They have a terrific guy who makes the prostheses that the kids need in the hospital's own shop. He works with very old machines and plastic sheets to form custom-fit braces for the kids. This is a happy place, believe it or not. The kids are well cared for. Rosalie arranged for a scroll-singer to be there. She is from a caste that paints scrolls, consisting of many panels, that depict events, myths, jokes and other stories. These singers used to travel from village to village and sing the stories as they rolled through the scrolls to tell villagers of news and to entertain them. There are scrolls and songs that depict the great tsunami of a few years ago, and the events of 9/11. There is also the story of the wedding of the fishes, which ends with a greedy fish devouring all the others. In the age of the internet, this is a vanishing art. We are lucky to have seen this performed. Afterward, we each worked with one child to create a panel that depicts something from their daily lives. 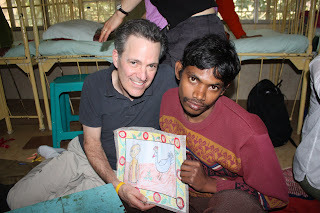 I worked with Ramesh Das, a disabled orphan boy. The instructor explained in Hindi what we were going to do, and, at first, Ramesh sat very still, just looking at the paper. I thought that perhaps he didn't understand, but finally he began to draw. As I worked on the border of the panel, Ramesh drew a smiling boy, and then a peacock, all with a blue pastel crayon. I thought he was done, but he grabbed one color after another and added detail and outlining to his figures. In the end, they were colorful, fanciful and full of life. He lives in an orphanage for boys, mostly deaf, run by a British man. A volunteer, Christy, had brought Ramesh to RCFC for the day. When she saw his drawing, she asked me if I had done it, or helped him do it. It seems that Ramesh had never responded much to efforts to draw him out, and she was amazed at what he had done. I got a hug and a smile from him when Jeannie took a picture of the two of us. We have been so busy over the last few days that no one has had a chance to get down the street to the internet cafe to write. And it has been so intense an experience that I have to sit and think a minute about what we did on each day. So, in (somewhat) brief . . .
Monday we visited one ot the Prayrona schools where there is vocational training for young women. The group who met us were between 14 and 15 years old. They greeted us with a daub of dye on our foreheads, and a namaste. We were paired up with the girls, and the task for the visit was to make a small bag - a simple design with a foldover flap that is closed with a snap. The fabric was already cut, and the interior piece was chain-stitched with our names and those of the girls. The girl I worked with is named Rani, which means Queen. The idea was that the girls would stitch the first seam or two, and then we would stitch some, and so on. Rani and I laid out the pieces of material, and I drew some guide lines for us to follow with our stitches. She started, and did the first two seams. The it was my turn. It was a simple stitch. I figured I could rattle right through it. Rani held the material tight to make it easier for me. Well, I am not a seamstress. On my first stitch I pushed the needle through the cloth and, apparently, into Rani's finger. At least I think that's why she yanked her hand back. After two more painstaking stitches, she took the thing out of my hands and resumed her work. It turned out very well. I was a little afraid that she was getting tired of my ineptitude, but she was thrilled when it was done, and smiled ear to ear at how pleased I was with it. (I will post a picture of the two of us - forgot to bring my SD card with me to the cafe). We all finished our bags and posed for pictures, and then the most amazing thing happened. The girls, it seems, also perform plays and skits. With almost no prodding, they got up and acted out a little play for us, a comedy. Even though we couldn't understand a word, we could tell when a comic character would appear, and they laughed and giggled along with the rest of the girls who watched. They also danced for us. It is remarkable how self-confident these girls are, particularly in this culture where girls are expected to work. From sewing school they will go on to learn tailoring, so they can design and make clothes. Rosalie says that they are being taught to be self-reliant, and we could see it in everything they did while we were there. In Indian fashion, it took as long to say goodbye as it did to do the sewing, but I was rewarded with a big hug from Rani. On Tuesday, we went to the village of Kharmagachi, about a two and a half hour, hair-raising drive from Kolkata. Through the city, then its outskirts, then through acres of cement factories and steel factories, and finally into flat countryside planted with mustard, we drove over potholed roads, playing chicken with oncoming traffic with every car, truck, pedicar and bicycle we passed. And our drivers felt that no car on the road should remain un-passed. At one point we stopped at a railroad crossing. Stay in line? Not on your life. On either side of the tracks, behind the crossing gates, the cars and trucks lined up like the linemen on a football field. When the gates lifted, it was nose to nose vehicles. But in some kind of well-understood ballet, the drivers pushed their way around each other, and we were on our way. Every kind of transportation seems to work that way here, from driving to walking down a sidewalk. There are just so many people! Everywhere! I've been looking forward to this day. We set out with Mr Ritwick on a tour of Kolkata. Since it's Sunday, the traffic (and the accompanying din) were significantly less than usual, but the crowds at some of the places we visited were in full force. We went first to the flower market, at the Kolkata side of the Howli Bridge. We got there at about 9, but the market had been humming since 5AM when the farmers start arriving by train at the station on the other side of the river Hoogli and wheeling their flowers across the bridge. It's a long alley where the vendors set up, strewn with wet flower stems and petals. The small booths display masses of flowers - in long ropes, in garlands, and in decorative arrangements. Most of the flowers are bought by retailers, who then sell them primarily for use in worship. Men with huge baskets balanced on their heads plod through the crowds. Running off the alley is a maze of narrow paths through shacks and buildings, where there are even more vendors. It's so crowded on these dark lanes that it is difficult to maneuver, in fact, difficult to make any forward progress at all. In the midst of this maze is a dilapidated bath house that still has amazing tile work inside. And on the other side is a ghat, or a kind of landing, on the river. Here, people bathe, do laundry, cook and eat. The riverbank itself is covered in garbage, and the place has an aroma that you don't quickly forget. But in front of you is the broad river, about 700 meters wide, and the expanse of the Howli Bridge nearly overhead, which is one of the busiest bridges in the world. It's hard to describe the quality of the light; the sun is out, but there is a haze in the air - maybe the river, definitely pollution and dust - that tints everything in a pleasing way. In the afternoon, we visited a Jain temple. The Jains are a minority religion in India that follow strict anti-violence principles. Our guide told us that some even wear dust masks over their mouths to guard against the possibility of accidentally swallowing a bug. The temple is a jewel box of mosaics, inlays of stones and small mirrors. In the center is a garden with statuary, curving walks and plantings. In the main temple building is an altar. In front of the temple is a statue of a plump and proper-looking fellow, who was an accountant who directed the construction of the temple complex. Respect at last! We were a little worn out for a big restaurant outing after the day of touring, so we stepped across the street from our hotel to the famed Blue Sky Cafe, which is a gathering spot for backpackers and other like-minded animals. It's busy and noisy (mostly because of the waiters screaming orders and questions at the kitchen) and you never know who you'll end up sitting with or talking to. The staff consider it ordinary to ask diners to move between tables in order to keep the maximum number of butts in the maximum number of chairs. Tonight, it was three anime-looking Japanese people, who when they left, were replaced with two pierced Dutch guys who were knocking around Asia for a while. They just looked for cheap air tickets and went. One of them mentioned to Patty, one of our group, that he had gotten a cheap ticket to Buffalo. She told him that there is a reason why tickets to Buffalo are cheap. We left him considering this thought.